George Washington was the nation’s first president, and he set a high example for all future presidents to follow. President Washington was the only president who did not live in the White House. He was instrumental in selecting the design and location of the White House, but construction was not completed until after he left office. President Washington and his wife, Martha, were very big entertainers at Christmas. Although Christmas cards were not used until the mid 19th Century, George and Martha Washington sent many invitations during the eight Christmas seasons that George ran the United States, and they were often joined by relatives, friends and many prominent people of the times. The only people who did not have days off for Christmas were the house servants. That same year saw Washington spending 18 shillings to bring a camel to Mount Vernon for the Christmas holidays. The Washingtons spent lavishly; they loved music, dance, and festive occasions and would send hand written invitations to friends and family to celebrate the twelve days of Christmas. These were the “Christmas cards” of the 1800s. Long before George Washington planned the White House he had the job of commander in chief of the colonial troops. This small army was first billeted outside Cambridge, Massachusetts before the real intense fighting began. Martha Washington and George’s stepson and his wife, Jack and Nelly, along with several friends joined him at his winter quarters just two weeks before Christmas, 1775. It appears that his first Christmas as a general was the last cheerful one spent for several years. The most famous Christmas celebration by George Washington occurred before he was president. While commander of the colonial forces, Washington made a bold move that helped breathe new life into the fledgling republic. Without sending Christmas cards or announcements to warn the enemy, General Washington crossed the Delaware River from Pennsylvania into New Jersey with 2,400 men on Christmas Day of 1776. They marched to Trenton and captured almost 1,000 Hessian troops stationed there. After taking what supplies they needed, Washington and his troops retreated back across the Delaware for a few weeks and in early January did another successful surprise attack on Princeton. 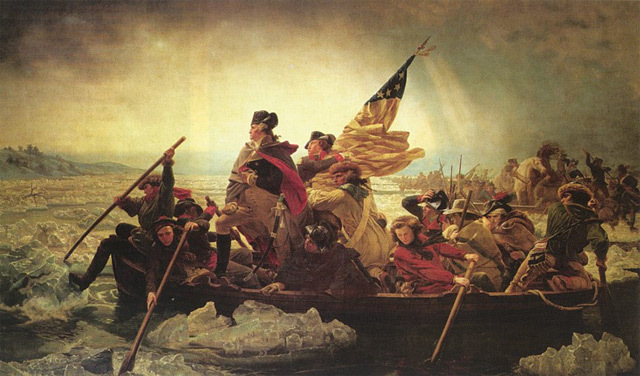 The famous painting by Emanuel Letuze, Washington Crossing the Delaware, is probably the most well-known depiction of the American Revolution. This painting has been depicted on several cards and may have been used as a patriotic Christmas card. Interestingly enough, most people overlook the inaccuracies and accept the heroic painting as fact. The flag depicted in the painting was not created until a few years after the crossing and the boat depicted is not one that would have been used for transporting troops. The fact is, if Washington stood up during the crossing, he would have fallen in the river. Emanuel Letuze's painting, "Washington Crossing the Delaware,” depicting George Washington’s famous Christmas Day voyage across the Delaware River, leading the colonial forces to a victorious sneak attack on the Hessian troops stationed in Trenton. George Washington was the first child born to Augustine and Mary Ball Washington in Westmoreland County, Virginia on February 22, 1732. George had two older half brothers. He was raised and educated their home, Ferry Farm, by his father and eldest brother, Lawrence. He spent his early Christmases as many young Virginian boys did, enjoying fox hunting, shooting his gun, and eating special Christmas meals. When he was 11, his father died and most of the estate went to George’s half brothers. That was the year that George copied the poem “On Christmas Day” into his exercise book from the Gentleman’s Magazine of London. George was the oldest child and he helped his mother manage the small plantation where they lived while attending local schools. He excelled at mathematics and learned how to do surveying. His brother, Lawrence, and his wife would often have George stay at their home, Mount Vernon, where he was able to learn social graces and be introduced to society in Virginia. His formal education ended at the age of 15 when he secured a position as a surveyor with an expedition to Western Virginia and then was employed as a county surveyor. Washington was able to move into a solid position among the gentry class. He saved most of his money to buy unclaimed land in Virginia and increase his holdings. George Washington took time off from his surveying in 1751 to accompany his brother to Barbados with the hope that the tropical air would cure Lawrence’s tuberculosis. While there he was able to view British fortifications and spend time in the company of many military men. This helped spark his interest in entering the military field. Unfortunately, he also contracted smallpox before returning home. After Lawrence died in 1752, Washington inherited Mount Vernon and his brother’s position in the Virginia militia as a major. The following year French troops were trying to expand their territory and came down from Canada and built forts in an area claimed by Virginia. Major Washington, at the age of 21, was sent with a message from Governor Dinwiddie to the French demanding that they leave the area immediately. He left in the fall of 1753 on a 900 mile trek through snow, woods, and an ice choked river. His guide suffered frostbite, but Washington had no ill effects from the journey except a rather cold and wet Christmas spent in the wilderness. A few months later, as a lieutenant colonel, Washington led some militia to oust the French from Fort Duquesne on the frontier. He was defeated and forced to surrender, but his actions led directly to what became known as the “French and Indian War.” Washington relinquished his commission after his surrender following this incident. Two years later, Washington was back on the frontier aiding General Braddock. When a battle ensued, he had two horses shot from under him and four holes shot through his jacket while trying to rally the troops for an organized retreat. He was given command over all of the Virginia militia and was expected to guard the frontier. This area was 350 miles long and he had a few hundred men at his supervision. He learned how to command, which served him well in future years. When the war on the frontier ended Washington resigned his position to return to Mount Vernon. The fact that British officers of lower rank would outrank him was a large part of his decision to resign. He was 27 years old at the time and had the distinction in Virginia as the most experienced native military officer with a vast knowledge of the frontier. Shortly after Christmas of1758, George and Martha Washington were married on January 6, 1759 and moved with her two children, Jack (4) and Patsy (2), to Mount Vernon. Martha was an excellent hostess and as a wealthy widow brought money to the marriage that enabled Mount Vernon to become a rich plantation and a hubbub of social activity for many years. George was a very successful gentleman farmer during the quiet years before the Revolution. He became a member of the House of Burgesses and had a front row seat for the progression of grievances against the British. Washington was instrumental in setting up the first Continental Congress and after fighting broke out in Massachusetts, he came to the second Continental Congress dressed in military uniform to show he was prepared for war. The Continental Army was created on June 14, 1775 and Washington was appointed as major general and elected by the Continental Congress to be Commander-in-Chief of the army. Two days before Christmas in 1783, Washington resigned as General of the Continental Army and relinquished the power to become king. Shortly thereafter, he headed home to Mount Vernon to spend Christmas with Martha. During the next eight years while Washington governed the army, he spent Christmases in Cambridge, Massachusetts; Valley Forge, Pennsylvania; and Morristown, New Jersey. Often he was short of supplies and he had to deal with betrayals, deserters, and the burden of command. Washington had as many defeats as successes, but he finally was able to defeat Cornwallis at Yorktown in 1781. Although many people wanted him to be king or emperor, he remained true to his democratic beliefs and turned down the offer of power. He remained with the army until December 23, 1787 when he formerly retired his commission as commander-in-chief with the intention of retiring to a quiet life at Mount Vernon. Washington arrived home in time to celebrate Christmas Day. 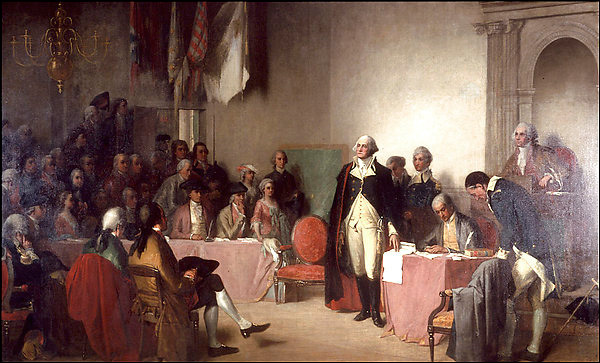 In 1787, Washington was convinced by friends that he should attend the Constitutional Convention where he was promptly made the president of the convention. Although he rarely gave his opinion, he was able to keep the other participants working on the Constitution. Because of the great respect for Washington, his support of the Constitution helped the colonies decide to quickly ratify it. Shortly after ratification, Washington was unanimously elected President of the United States by the electoral college. He originally turned down the salary, but was convinced to accept $25,000 a year so he didn’t set a precedent for only wealthy men to hold the office. During the following eight years, President Washington set foreign and domestic policies, established how the President would conduct his office, appointed the most Supreme Court justices of any president, and began the practice of having regular cabinet meetings. He preferred the address of “Mr. President” to more exalted titles that were suggested. Washington wanted to keep the office free of any hints of royalty and straight on the road of republicanism. He was able to select where the District of Columbia would be and saw the building of the nation’s capitol started by laying the cornerstone for the White House. 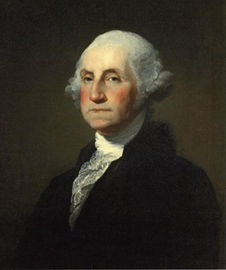 Although he was asked to run for a third term, Washington firmly refused and retired to private life after a farewell address that set the plans for the government for the next few years. President Washington missed the Christmas of 1799 when he fell ill on December 12th and died on December 14th. In his will Washington left provisions that his slaves would be freed upon the death of his wife Martha, however, she freed them shortly after his death. George Washington is, to this day, considered the most honorable and beloved president. There are many places that bear his name including the nation’s capital. Wow, what a history. What makes George Washington my all time favorite President is his character in his private life, that was important to me. Because good character in private does influence the public life. That’s why he is number 1 in my book, then Abe Lincoln both men of good character. Wish we had politicians with these characteristics today. A man of extraordinary principle, character, judgement, leadership and humility. To be addressed as “Mr. President” at his request displays his belief in the equality of man. A believer in Providence, as is evidenced in his writings and speeches, shows an individual who is aware of a power greater than himself. Presumably no better choice could have been made than to elect George Washington as a fledgling nation’s first president. You mention briefly that Washington was in Cambridge, MA, but that omits a rather important scene that in fact strengthens your point very specifically. He had the Anglican Christ Church, Cambridge (across the common where his troops were camped) open for a service between 25 Dec. and 1 Jan., and invited other Tory Anglicans in the area to attend as well. This would have been unusual in that the Massachusets Anglicans were nearly all Loyalists, and thus anyone worshiping in an Anglican church was suspect of having other than patriot loyalties. For the commander of the patriots’ troops to celebrate an Anglican service (let alone a Christmastide service, which Bostonians did not observe) was to make several statements about his latitudinarian views and his generous theological and philosophical nature overall. It makes sense when one recalls that he was raised in Virginia, whose established church had always been Anglican, but transplanted, his action takes on several added dimensions in favor of toleration and pluralism.